We are always available to offer support and believe all items on the website are accurately described and represent good value for money. If you decide that you would like to return an item, we urge you to contact us first to see if we are able to find a solution to the problem. If, after speaking to us you are still unsatisfied with any of our products, for any reason, we offer a 30-day ‘no-fuss, no-quibbles’ 100% return policy. 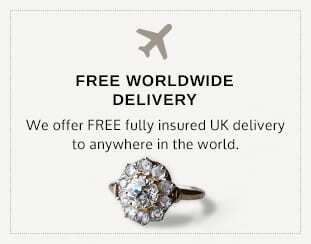 Items must be returned at your cost via a secure and insured service. Do not send the item through normal post as we cannot be responsible for lost items. We recommend all returned items to be sent via courier or Royal Mail Recorded Next Day Delivery with cover for the item value in case the item is lost. In the case of any error on our behalf we will cover the cost of return shipping. However, if items are damaged or altered in any way they will not be accepted for a refund. Since all items sourced are pre-owned, there may be a few slight scratches or signs of wear. However, we will not list any items which are broken or obviously damaged. On each individual item a 4-point scale will be used to represent our honest opinion on the condition of the item: Excellent, Very Good, Good or Moderate. We do not sell anything we believe to be below moderate condition. We send all items in plain jewellery gift boxes. Occasionally, we have the original box the item came in, a designer box to match the item or a one-off antique box. If the item comes in one of these boxes it will be explicitly stated in the product description. We will explicitly state on the product page if the item comes with supporting paperwork or certificates. If there is no mention, then please assume that we do not have any paperwork or certificates. We guarantee all items are authentic and genuine, and if for any reason you are unsatisfied we have a 100% return policy. We believe everything on the website is fairly priced and reflects good value for money. We will not respond to any emails asking for discounts or movement on the price. Many thanks. Most of our rings can be sized to any finger. We will state in the product description whether or not a ring can be resized. 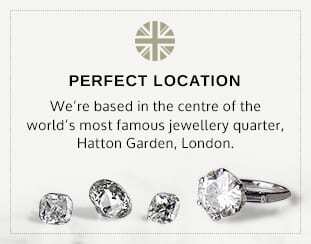 We charge a fee of £10 for ring sizing three sizes up or down from the original size. A resize outside of this range will incur an additional charge of £5. 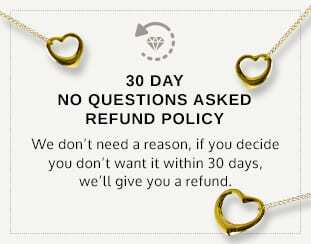 Once a ring has been resized it is ineligible for a refund or exchange.